Charging The Hf Coil - Issue?? Has anyone had this issue? Occasionally when charging my elliptical HF coil it will not start the 3 second on/3 seconds off indicator once it is charged. I changed it for hours yesterday and the most it would do would be that the light would occasionally flicker. Finally I took it off charge and the controller indicated that the coil was fully charged. The coil seems to function fine other than that. Interests: Metal Detecting, Peace and De-Stressing, PC's and Networking/Network Security, Meeting good people. Have you made sure the connectors on the coil are clean and free of any corrosion or dirt/dust? It could be your charger too. Have you tried a different charger? Maybe that has something to do with it. It also could be the cable. What about trying a different one. Just some ideas. I did try a different charger. I will check out your other suggestions. Thanks! Button Finds With The Orx. Questions About Tones? I found these buttons yesterday with the ORX. Two of the buttons were "D" buttons and one was a "V" button. While I'm glad the ORX hit the targets I'm unsure how I was able to tell if they were digable targets. Granted I don't have a lot of hours with the ORX but I'm having significant problems trying to identify good targets. The target ID numbers seem to be unreliable and the tones seemed to be slurred once you get past the iron tone. I'm not knocking the machine but was hoping for some tips on the "how to" of recognizing the "dig me" targets. I have the HF Elliptical coil and I'm detecting in fairly trashy areas. Any tips would be appreciated. Thanks for looking! Any chance XP will push an update that may help with TID and tones? I found my first silver coin with the ORX this week. A nice 1853 half dime! 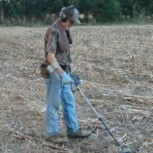 I hit various areas and in the big fields been using the AT Pro with a Nel Big 17x15 coil. Buddy of mine just got the AT MAX with stock coil and goes just as deep as the Pro with the big. How does the ORX compare to the MAX? Does it have an All Metal Mode? I like the idea of something super light and the choice of frequencies as the AT Pro doesn't find really small gold targets with it's low freq.